Petra performs "Destiny" & "Creed" live at the Farm Aid concert in Irving, Texas on March 14, 1992. Farm Aid was started by Willie Nelson, Neil Young and John Mellencamp in 1985 to keep family farmers on the land and has worked since then to make sure everyone has access to good food from family farmers. TV-broadcast with only two songs (Destiny and Creed). This is the performance that John mentions in the Wake-Up Call Video Collection. Petra did also play "Who's On The Lord's Side" but that song wasn't aired. Only the first two songs were aired. 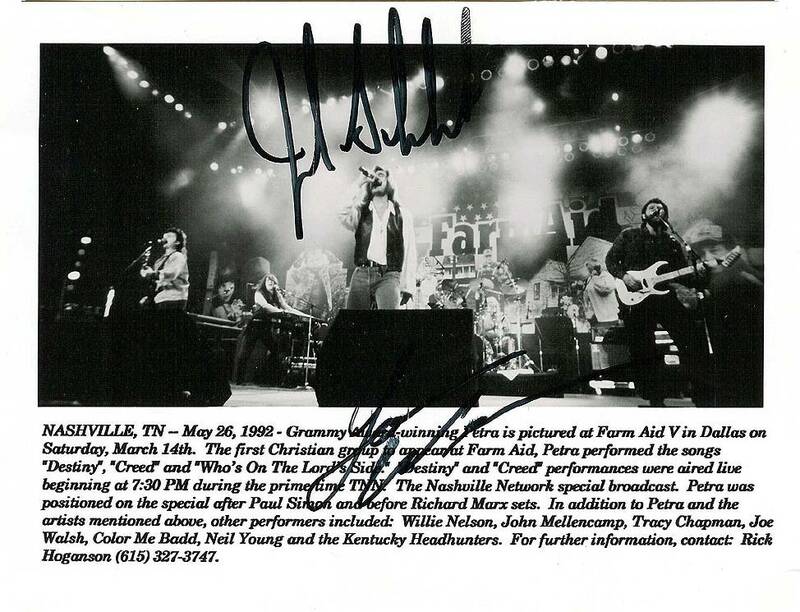 This concert also featured artists such as The Highwaymen, Lynyrd Skynyrd Neil Young, Tracy Chapman, Kentucky Headhunter, Mary Chapin Carpenter, Paul Simon, Little Village, Mark Chesnutt, Arlo Guthrie, Lorrie Morgan, John Mellencamp, Richard Marx, Paul Metsa Joe Ely and Willie Nelson.